I could say that today I lost my favorite aunt. Or, I could say that I lost my favorite aunt in November. Or I could say that I lost my favorite aunt January 3rd, 1999. Or, I could say that I have two favorite aunts still with me. You see each and every one of my aunts is my favorite because each one in her own way reminds me of my mother who left this world in 1990. Today is my favorite Aunt Janice’s day. She died late this afternoon when her family realized that she would not recover from the severe injuries she received in a car accident yesterday. I have had the opportunity to talk to Aunt Janice once each week since I came home from the hospital in January. She has faithfully called me to see how I am doing and to chat for an hour. Now, this in and of itself is an unusual event, my aunt is not a chatterer, but for the last six months she has changed her pattern. We had many interesting talks about many things. Recently, she was very concerned about her incredible back pain. I asked her if she had told her doctors about her polio. Silence—“no, I don’t believe I have. I’m all better they don’t need to know that”. I then tell her that my mom said that she just wished her doctor would listen to her that sometimes she felt like she had polio all over again. Aunt Janice told me that she just really didn’t remember anything about polio because she was so young when she had it. I told her that it certainly could be important to her medical history, and she should tell. But. that was my Aunt Janice when it was over it was over, and wasn’t important any more. Another conversation we had was about my stay in the hospital and how hard it was for her to see me hooked up to so many I-Vs and machines. She then told me that she hoped I understood what she was going to say. She told me that she wanted to be as lucky as her sister Virginia and die like she did. My mother died in a chair with a tall glass of ice water at her side after she had spent the morning running errands, talking to her friends. Aunt Janice just about did it except her leaving was a bit more dramatic and a bit more tragic. But no less sudden. These past few weeks my aunt had related that she was worried about her sisters, her brothers, me, her family. I told her that she shouldn’t worry about any of us that she needed to take care of herself and then, we would all be fine. Her sign off to me was always the same. “Be good. I’ll talk to you soon”. At the end of our last conversation, her sign off change, she said “I love you”. I love you, too, Aunt Janice. Each year, Sherry Perry, the owner of The Ugly Broad Tavern in my neighborhood, Brooklyn Centre, sponsors a series of fundraisers to benefit a local cause. Last year three tiny children-Ainia, JJ and CC Cintron lost their lives through violence. This year, in their memory, Providence House will be the beneficiary of Sherry’s fundraising efforts. Last year with the help of friends, neighbors, and patrons Sherry raised $3000 for Breast Cancer Research. Here are the details: Sunday, June 20th $15.00 per Bike $20.00 per Couple-Last Bike Out Noon (12 p.m.) Tickets available at THE UGLY BROAD 3908 Denison Avenue Cleveland OH 44109 216-351-9826. Be Back to The Ugly Broad by 6 p.m. It was hard coming out of the darkness, through the fog, and into the light. That sentence probably sounds melodramatic, and probably, a bit like pulp fiction, but it is accurate and the subject of another post. I find that while I have been away, my Aunt Sally died. I am sad. Then, I learn Thanksgiving has come and gone. I slept through Katie’s birthday. She was here. Mo, Geri, and the baby were by my side. The baby flew with the help of Dad or Grandpa above my bed at times. Friends and family stood watch while I drifted. Today, I am awake. I can’t walk. I can’t use my left arm. The fingers of my left hand don’t cooperate with my brain at all. Two people use a machine to help me to the bathroom. Tim feeds me. The nurses help me dress. But, I can talk, and do I talk. Visitors begin to fill my room and I tell them… I don’t remember what I tell them, but I know that I am happy and thankful to be there, and I talk and talk. Looking back on it being able to communicate is probably The most important thing right now—the thing that holds depression at bay. A doctor steps into the room to assess me and tells me that I will probably have to learn to eat and write with my right hand. This statement disturbs me more than you can imagine. I am a “leftie” and am proud to be a leftie. I tell anyone who will listen, and in reply, I get this question “Isn’t it a bit early to tell”? And I think to myself. “Yes”. The second day I am in the stroke rehab my therapy begins. Each day I have three hours of therapy—occupational, physical, and speech. Each session works on parts of my brain that need to learn to coordinate and synchronize. On Saturdays, I will have physical therapy because it is the most needed. Sundays I get the day off as well as Christmas and New Year’s. By Christmas, I will need that day off. These Physical Therapy guys and gals know their stuff, and they are the ones who will help me walk again. I will start with them. My physical therapist asks me “What is your goal? What do you want to do when you leave here”? I tell her, “I want to dance again”. At this point in time, I am in a wheelchair. I cannot take three steps alone. My left arm is learning to stay out of my way, but at times, is very unsuccessful. She stops, but never hesitates. She says” let’s see what we can do about that”. Many of you know that last November began a a very long and scary adventure for my family, friends, and me. Some of you don’t know the details but know I haven’t been around much any more. Today, I got clearance for Cardio Rehab and I believe that it is safe to say that I am out of the woods and on a long trek back. It is time to begin the story. Today I will begin the story of the last six months. I have decided to share my experiences at MetroHealth with my wider net of community because, if nothing else, you may see that anything is possible. Let me say this, I have no answers only the experience itself to illustrate what is possible. My aunts continue to say “it is a miracle”. My doctors don’t say they are wrong. Me, I don’t remember the first 23 days. Tim tells me it is just as well. As I learn bits and pieces I can only say I believe him. On the seventeenth day of November I traveled to MetroHealth courtesy of Cleveland EMS. Within minutes, I was there. Tim says he never saw so much activity, so much determination and focus in one place. It appears that day I suffered a heart attack. Shortly after, I suffered three strokes. Somewhere in there are a stent that became clogged calling for three more, two cardiac arrests, and after a talk with my cardiologist about just how dire my situation was, a DNR was put in place. My friends and family were greatly impressed that my doctor included them in the status report after asking Tim if he wanted to do it or could he? Roger later heard this same doctor tell a group of interns “this woman is the sickest patient in this 700 bed hospital”. After they took a CAT scan, the doctors told Tim and the girls that chances were good that I would never go home again. There was a great probability that when I left the hospital I would enter a skilled nursing home where I would eventually succumb to pneumonia. Tim said he wasn’t ready to seal my fate on a few fuzzy pictures of my head. My doctors agreed. And this is where my family, my friends, you, and many I have not met or know enter the tale. Tim had already called people. The girls, Geri and Teagan were there. Many of you had already been to see me, to hold my hand, to remind me of all our good times, to thank the nurses and doctors for me because I could not. Tim asked for help. He asked for your prayers, your energy, whatever you had to give. Whatever you did, however you did it, I am here to say it worked. On December 10, the woman no one expected to live left CCU and moved to the Seventh Floor to begin Stroke Rehab. Here’s an important announcement, in its totality, from our neighbor Bill Callahan. Today is the big twice-a-year Street Sale on Archwood Avenue, where I live. (Tomorrow, too.) I’m currently sitting on my front porch watching the shoppers go by and showing those who ask how our new “Free Archwood WiFi” works. Free Archwood WiFi currently consists of Open-Mesh minrouters on three front porches as well as in two windows, all getting bandwidth from another minirouter attached to a standard DSL router and serving as the gateway. Each minirouter cost only $29. (Well, actually, they cost us nothing so far… we borrowed them from One Community, which is “sponsoring” our experiment in viral networking). Total equipment cost to date: Less than $200. Most of the nodes have been operating together for the past 48 hours or so, with zero problems or downtime. Open-Mesh is a nonprofit open-source “fork” from the more corporate Meraki viral mesh system, best known for its Free The Net project in San Francisco. Both trace their pedigree and personnel to the venerable RoofNet initiative at MIT. 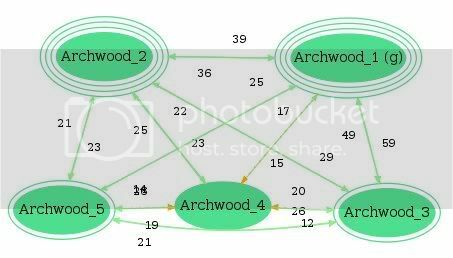 For the geeks, here’s the current Free Archwood network diagram from our online dashboard provided by Open-Mesh. (The outer lines around the nodes are current users). We have a new granddaughter this past year, and her name is Teagan. Here, on wiki.name, is a great research resource for name origins, spellings, meanings, namesakes, and name-alikes. As a surname, Tegan may be related to the Irish name Tadgh or Taidgh, which means “poet.” Some of the variants are Teigue and Teige, which could have transformed into Tegan or Teagan. As a surname, it most likely arose as a patronymic, McTeague or McTague, meaning “son of Teague.” The surname is Irish in origin, specifically from the region of Connacht. Usage of Tegan as a feminine name is modern. Historical usage is probably a mistranslation of a similar name, such as Tegau. In the United States, the spelling Teagan is more popular than Tegan. Tegan first appeared on the top 1000 chart of most popular baby boy names in the year 2007, ranking at number 985. As a girl’s name, the spelling Teagan first appeared on the top 1000 chart in 1999. Popularity has steadily risen. In 2007, Teagan was the 408th most popular name for baby girls in the United States. As a boy’s name, the spelling Teagan appeared on the chart in 2004 and ranked at number 677 in 2007. Like other contemporary names such as Jayden and Riley, both the gender and spelling are just a matter of preference. The more it is used, the more likely it is that one gender and spelling will become conventional. Tegan is a very popular girl’s name in Australia and New Zealand. It reached a high point as the 84th most popular name in both countries, during 1999 in New Zealand, and 1997 in Australia. Tegan is a popular girl’s name in Canada. It was most popular in 1997, when Tegan was the 328th most popular girl’s name in Canada. Popularity slipped a bit, but it remains a top 1000 name. In 2005, Tegan ranked at number 493. It has also begun to see usage as a boy’s name. In 2005, Tegan was the 574th most popular boy’s name in Canada. This is the annual Archwood Street Fair of renown. * We’ve been having it for so many years now I have to ask somebody else when it all started–I think it was in 1980-something. Originally, we tried to sell a lot of rehab and restoration items as well as antiques, and that is still the basic purpose. It now also functions as a way for all of us to clean house, so it’s taken on aspects of the huge neighborhood garage sale as well. Some of us who don’t live on Archwood actually haul our stuff in the night before. The inventory is usually pretty good. Further, some entrepreneurs now set up food stands and assorted flea market venues. It’s a real melting pot…Open source. It’s also ideal for bicycles and walking. The stated hours are from 9 AM-6 PM on Saturday and 10 AM-5 PM on Sunday, and some people stay open a little longer, and some people wrap up early. This year will also feature some fun, music, and art events. Brooklyn Centre Naturalists will have a table set up near the action. Stop by our booth and see how easy it is to become a wildlife habitat. Buy one of our raffle tickets for a chance to win an incredible basket full of gardening treasures. Any of you who attended Earth Fest this year knows how incredible Greg Cznadel’s baskets were. If you can, check out the joint gardening project of Brooklyn Memorial Church and us.